Country fans, get ready for an incredible, once-in-a-lfietime experience. 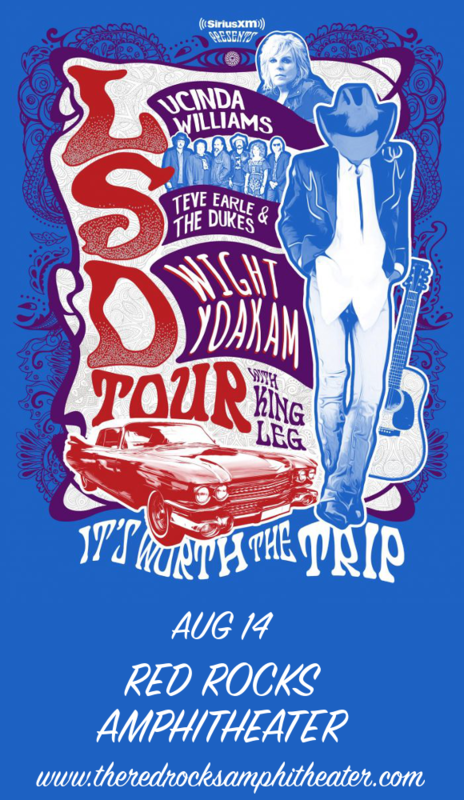 Phenomenal performers Lucinda Williams, Steve Earle and The Dukes and Dwight Yoakam are on the cleverly titled “LSD Tour,” coming to the Red Rocks Amphitheater on Tuesday 14th August 2018!! No fan of a single one of these artists can afford to miss this concert at the world-known iconic Colorado venue – book NOW while tickets last!! Starting out in a traditional country and blues style, Lucinda WIlliams saw her first major commercial breakthrough with "Car Wheels on a Gravel Road," a remarkably diverse album that showcased blues, rock, and country while still maintaining a clear and coherent sound. The album received widespread commercial acclaim, earning Lucinda Williams a Grammy Award for Best Contemporary Folk Album. Since then, she has earned several more prestigious awards and nominations and become widely regarded one of country’s greatest musicians. One of the most prolific writers to come out of Nashville, Stephen Fain Earle has had his songs recorded by the likes of Johnny Cash, Vince Gill, Patty Loveless and Emmylou Harris. His breakthrough album, “Guitar Town" of 1986 hit number one on the U.S. Billboard Top Country Albums and was ranked by Rolling Stone as one of the 500 Greatest Albums Of All Time. Last but absolutely not least, it’s Dwight Yoakam, one of country’s biggest stars with 5 number-one albums, more than thirty singles on the Billboard Hot Country Songs charts, and record sales of more than 25 million!! So what are you waiting for?? Get your tickets NOW! !